Henhouse Pottery: Cone 10 just out of reach. I don't quite know what's going on with today's glaze firing. I had to change gas bottles at 600 degrees to the smaller bottle(21kg). At 1190 degrees the kiln seemed to stall - I thought it was due to a lack of pressure, but the bottle still seemed almost half full. At 8pm cone 9 started to bend (how?) but only slightly and then the pyrometer started to show a slight drop in temp - the cone didn't continue to bend but also stalled semi bent. 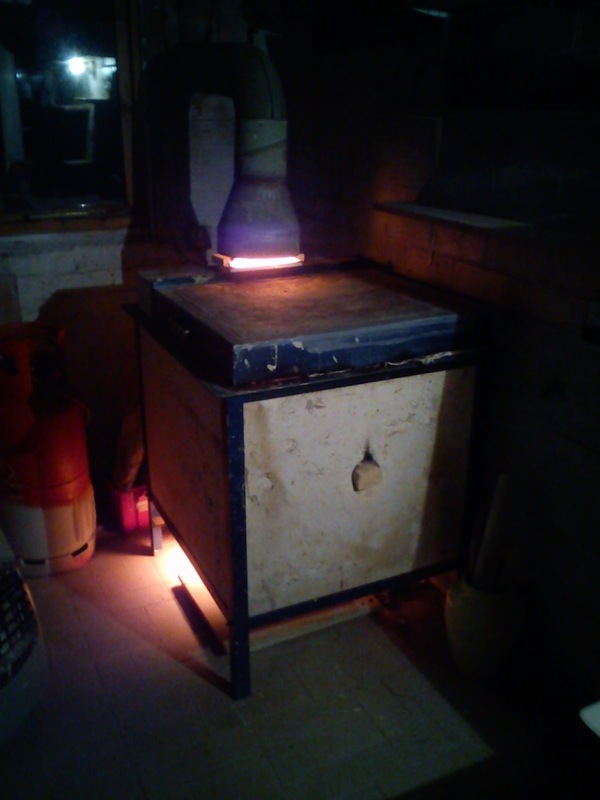 I thought I'd have to accept an underfired glaze and so put the kiln into reduction. 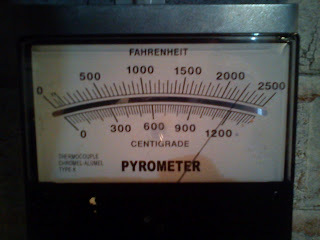 Unusually, in reduction the temp didn't drop, but remained at 1180 degrees. When the reduction was finished cone 9 had gone. I've just taken another look after 15 minutes of oxidation and the kiln seems to have stalled again at just shy of 2000 degrees. all these temperatures are taken from the pyrometer, which is clearly misreading at these higher temps, as cone 9 has gone but apparantly we never got to that temp? 35 minute soak after cone 9 went, but never reached cone 10. Oh well, more research needed!